Last week amid a flurry of other high-stakes news, President Donald Trump took a moment to tweet about another pressing issue — global warming — but to question its influence on extreme winter weather. Trump re-upped his position this Monday, just before an extreme cold front barreled into the Midwest. So far, the plunging temperatures — cold enough to freeze exposed skin within 15 minutes — have caused the cancellation of more than 1,500 flights, killed at least 13 people, triggered school closures in Wisconsin, Minnesota, Michigan, Illinois, Iowa and North Dakota and helped set cold temperature records in all 50 states. Meteorologists predict the cold will last until week’s end, forcing Midwesterners to shelter in place against the lethal weather. Trump’s tweets suggest that global warming and cold weather cannot co-exist, an assumption that harkens back to an old cliche in this public conversation: “Climate is not weather. Weather is not climate. They should not be discussed together.” But that’s a misunderstanding. Why is the president suddenly focused on cold weather? One answer could lie in the polls. The confusion could be because these Midwestern cold spells seem to counter what climate models predict for this region. The Midwest is expected to warm and get rainier, extending growing seasons and improving the quality of life for the farm belt — and yet deadly polar vortex intrusions into the mid-latitudes have also become more common. The contrasting trends don’t mean that there’s uncertainty over the climate science — but rather that the planet may be reacting to carbon emissions in unpredictable ways. Trump’s tweets were unexpected as well, because he has rarely posted about global warming or climate change since his inauguration. He went nearly a year between writing posts about global warming — Dec. 2017 to Nov. 2018 — before firing off two messages using that phrase in a week. His last mention of the “climate” — a retweet of a Fox & Friends segment — came more than a year ago, to toss shade at the Paris accord. Trump may be looking for an easy way to curry public favor after the shutdown debates hurt his approval ratings. Once climate disasters start hitting close to home, our perceptions of climate risk shift. More Americans than ever — 73 percent — believe global warming and climate change are happening, according to polls released last week by the Yale Program on Climate Change Communication and the George Mason University Center for Climate Change Communication. But another of their national surveys from last year also suggested that this environmental issue is one of the most divisive. While global warming and climate change have a legacy of being overlooked and under-discussed in national politics, there is growing evidence that these issues will take the stage in the next election — especially in this climate of partisan politics. Here’s what you need to know about the polar vortex and why it might have inspired the president’s tweets. Remember, remember! Climate affects the weather. Weather is what you experience in the moment. It is how the atmosphere behaves around you on short-time scales — this week, today, right this second. Climate is the collection of all these little events — which when tied together, tell the environmental story of our surroundings. They reveal what has happened and what we can expect to come. If weather is like a single baseball game, then climate is the standings at the end of the season. If the Boston Red Sox go on a winning streak — or a losing one — it’ll affect their odds of winning their division and going to the playoffs. But where you rank at the end of one season can affect your individual games in the next by determining your position in the next season’s draft. In the same way, climate patterns can affect day-to-day weather. As the planet’s individual days become hotter and hotter, scientists can predict that some places will experience more days of drought or rainier hurricanes. Global warming can also influence winter weather, which may explain current events with the polar vortex. 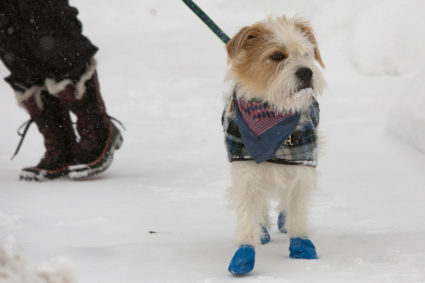 The polar vortex — a massive cyclone of cold air — forms every winter, as temperatures drop. Typically, a jet stream of westerly winds encircles this polar vortex, trapping the cold air over the pole like a crown holding hair in place. That is, as long as this jet stream — named the Polar Night Jet — isn’t disrupted. When this happens, the polar vortex loses its circular cyclone shape, and blob-like arms of cold air start moving south. Sometimes, the polar air lands in Asia; sometimes it goes off to Europe, as it did in 2017. Other times, it heads to the United States. What’s happening this winter is the other type of polar vortex disruption, called splitting. 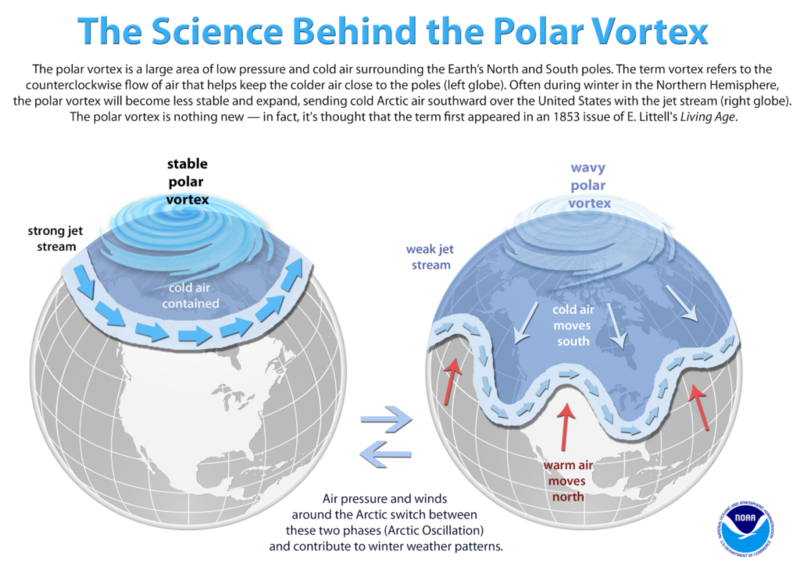 If the warming comes in from two directions, then it will cut the polar vortex in half, Cohen said, or even into three pieces. In late December 2018, the Arctic experienced what’s known as sudden stratospheric warming. A heat blitz struck the polar vortex, sending abnormally warm air more than 25 miles up above the North Pole. 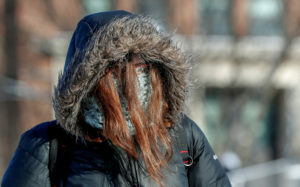 The severed chunks of the vortex began creeping across Canada, taking weeks to reach the U.S.
“Some of the coldest air in the northern hemisphere right now is sitting over parts of southern Manitoba and into Minnesota,” said Bob Smerbeck, a meteorologist at AccuWeather. The coldest air in both hemispheres typically exists at the poles, and AccuWeather estimates that this week’s freezing temperatures could cost the U.S. economy up to $14 billion. Note that, jet stream disruptions of the polar vortex can happen naturally. If El Nino sparks up, or a strong wind hits the right topography — a mountain range for instance — it can change the course of the planet’s jet streams. But since 1990, Arctic temperatures have risen, known as Arctic amplification. That has coincided with longer and more frequent bouts of below freezing temperatures during North American and European winters. Cohen and other scientists cite chaos in the polar vortex as the link between these trends, and they have noticed other strange patterns within the disruptions themselves. Over this time period, the Arctic has also experienced some of its hottest temperatures on record. Cohen and company think the loss of sea ice, which helps keep heat trapped on the planet’s surface, has accelerated this warming — and may explain why vortex disruptions have impacted North America, Europe or Asia during six of the last 10 winters. Critics of this emerging research would argue that a 10- to 30-year pattern doesn’t provide support to claim a connection to anthropogenic climate change. The effects of human-made climate change will continue for decades if not centuries, but the Arctic amplification hypothesis has not accumulated enough evidence yet to indicate what to expect for future polar vortexes, Cohen said. That distinction is key because a long-term cooling pattern is not currently predicted for North America, especially the areas of the Midwest suffering right now. Climate change models predict that the northern U.S. will heat up. This warming may increase precipitation — and by extension snowfall during the winter — but days below freezing should decline. Even if these polar disruptions are a short-term phenomenon, the climate forecast for the Midwest is bleak, according to an analysis published Tuesday by the Brookings Institution. 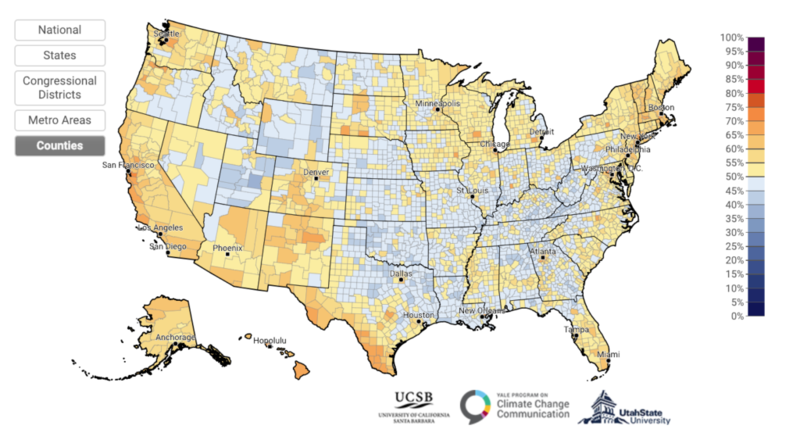 The report showcases how climate change will cause billions in economic losses for the counties, states and people who currently believe the least in climate science. The Midwest, which has occasionally borne the brunt of the polar vortex, is also home to the Americans who are least likely to support that climate change is caused by humans. The estimated percentage of adults who think global warming is mostly caused by human activities. You can check on the 2018 data for your county via this link. Map via Yale Program on Climate Change Communication and the George Mason Center for Climate Change Communication. “Basically stretching from North Texas into the Dakotas and then a little bit to the west of Wyoming, that’s really where you find the highest concentration of” people who dismiss climate science, Leiserowitz said. Some Midwestern farmers have welcomed the rising temperatures, prolonged growing seasons and the potential access to new crops. But the heat will eventually split the agricultural gains into haves and havenots. Farmers in the Interior West and upper Midwest — Idaho to around Minnesota — will continue to reap the benefits. But outside the Great Plains, the economic projections worsen over the next 60 to 80 years. 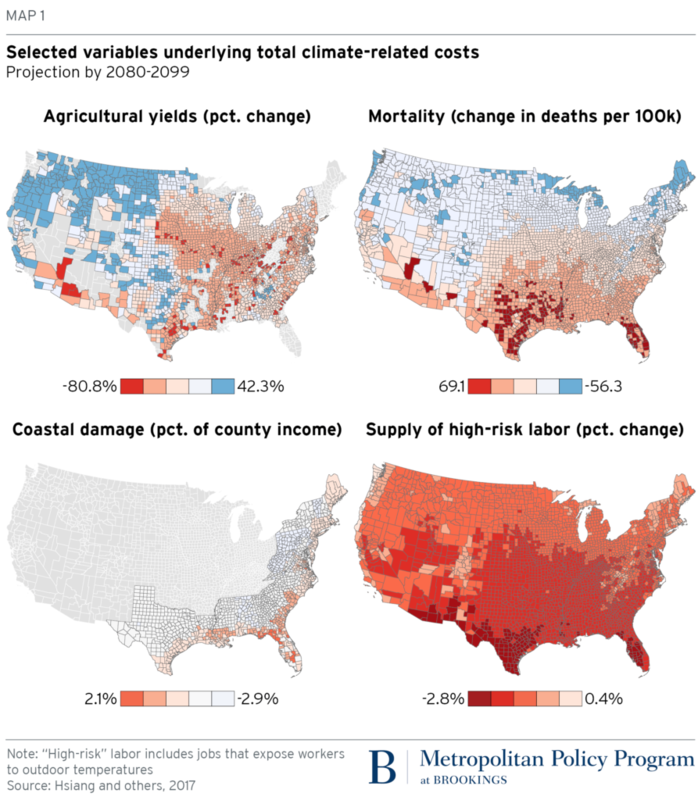 This map shows four economic cost predictions for the U.S. based on how climate may change by the end of the century. Map courtesy of Brookings Institution based on Hsiang, S. et al. Science, 2017. 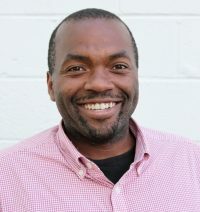 “The dominant cost to the economy of climate change is [human] mortality from excessive heat,” said David Victor, co-chair of the Cross-Brookings Initiative on Energy and Climate and co-author of the report. Heat will not only harm crops in these areas, but the labor supply as well, due to outdoor workers being exposed to heat stroke. The Southwest faces a similar dilemma with drought in the long-term, while Texas, Florida and the Southeast have the added threats of rising sea levels and intensifying hurricanes. These geographical predictions bring us back to how climate change has evolved as a political issue. “Our mapping shows that climate change is going to impose the greatest economic losses at a county- and local level on Republican voting areas,” said Mark Muro, Brookings senior fellow and director of the metropolitan policy program, who noted that those areas “are notably not supporting efforts to combat climate change at this point.” Indeed, farm and big oil lobbies have reportedly teamed to prevent the regulation of carbon emissions. Over the last decade, Americans in general tend to label climate change as a distant problem. 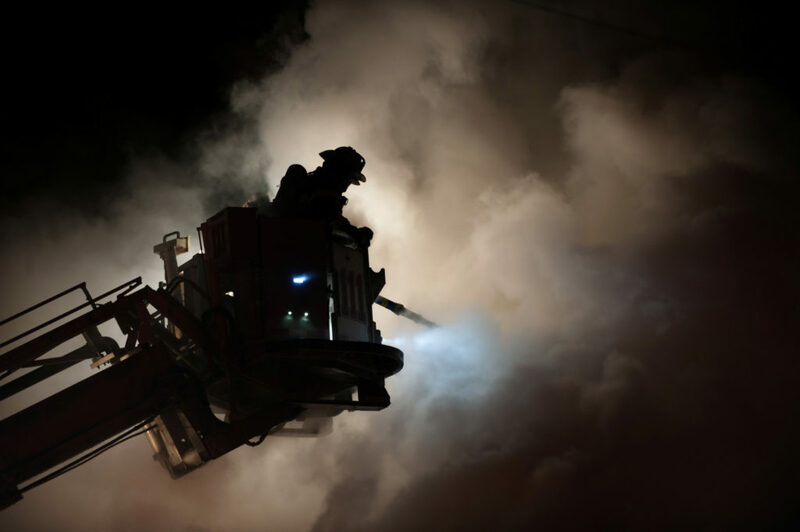 These climatic shifts won’t happen overnight, and our humans brains are notoriously bad at valuing far off future risks — a mental dissonance that shows itself in Yale’s polling on climate change, Leiserowitz said. Ten years ago, both candidates for president — Barack Obama and John McCain — accepted that climate change was happening and caused by humans. The position was even in the GOP national platform in 2008. But the rise of the Tea Party in 2009 and 2010 coincided with a Republican shift away from climate science, a change documented by Leiserowitz and his colleagues. Republicans have been slowly working their way back. Multiple polls from last year suggest a growing proportion of the GOP believes that the global climate is changing, even if they don’t buy human contributions. Climate change acceptance has also increased among Democrats and independents. Research shows that political leaders can shift climate change beliefs, which may explain Trump’s tweets and why Democratic presidential candidates are touting the issue. “Remember most people really don’t know that much about this issue,” Leiserowitz said. And when Americans don’t have a lot of direct experience with an issue, “they tend to fall in line with what their leaders are telling them.